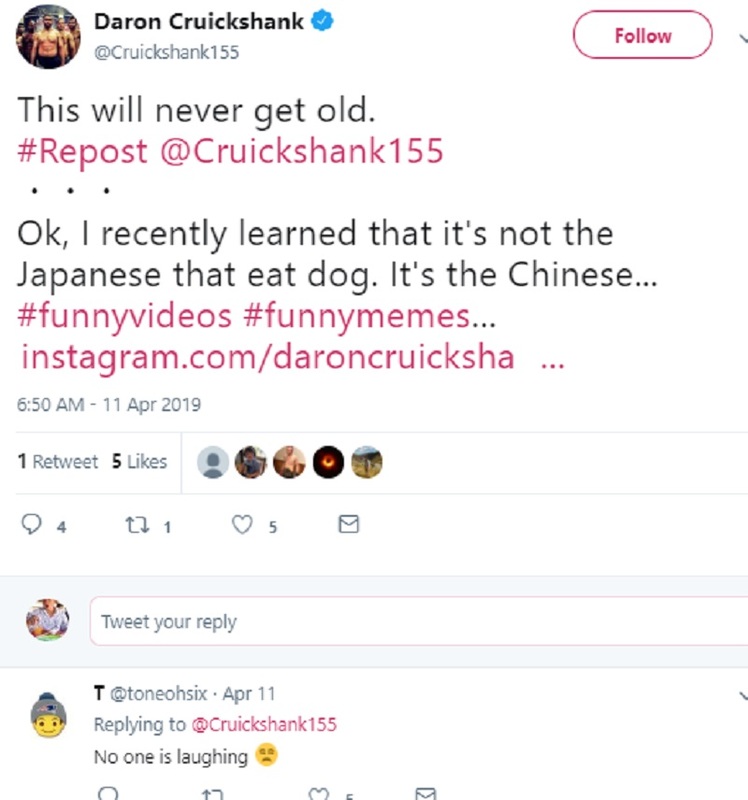 Mixed martial arts fighter Daron Cruickshank is being called out for mocking random Japanese people with the dog-eating stereotype in a video posted on his Instagram. Cruickshank, who earns a living in Asia, is employed by RIZIN Fighting Federation, a Japanese MMA company. “Yummy huh? Yummy?” he asked while laughing at the clueless onlookers. The joke, of course, is that they must be looking to eat the dogs because they are Asians. Finding nothing funny about the whole thing, Dynasty Clothing berated Cruickshank for his juvenile stunt. “For the record, if you travel anywhere in the world, different people from many different cultures including within Europe and Scandinavia also consume different animals such as dogs, cats, horses, whales, cows, seals, maggots, etc. – yet you won’t hear a single word about this in the media,” the post read. “Just because western media loves to highlight what small groups of people in Asia like to consume, doesn’t mean all Asians consume the same thing,” it added. The post, which tagged ONE Championship owner Victor Cui and chairman Chatri Sityodtong, reminded Cruickshank how his career depended on the culture he is making fun of. Cruickshank has since deleted the video but has yet to apologize for his actions.